The future of bump stocks in Maryland will soon be on the desk of Republican Gov. Larry Hogan, who has said he would sign it, even as opponents said the bill could be challenged in court. WASHINGTON — A bill to determine the future of bump stocks in Maryland will soon be on the desk of Republican Gov. Larry Hogan, who has said he would sign it, even as opponents say the bill could be challenged in court. The state Senate approved the bill Wednesday, on a vote of 35-11. State Sen. Victor Ramirez of Prince George’s County sponsored Senate Bill 707, which is paired with House Bill 888, sponsored by Montgomery County Del. David Moon. If Hogan signs the bill into law, it would amount to a near-total prohibition of bump stocks, and other similar rapid-fire devices, including those that haven’t been invented yet. “It says any devices that mimic bump stocks, and any device that accelerates the firepower (of a weapon) would be banned, here in the state of Maryland. 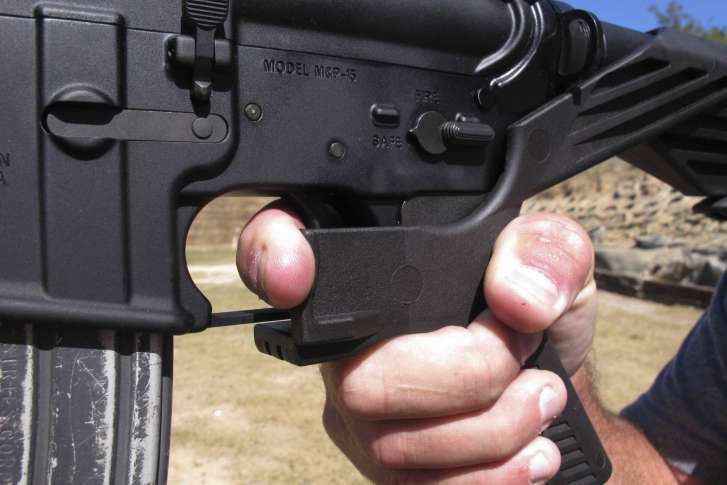 Opponents say the bill is ripe to be challenged in court, because bump stocks purchased legally before the ban would now be considered illegal. Introduced in February by Del. Geraldine Valentino-Smith, D-Prince George’s, the bill would allow law enforcement to seize guns in domestic violence cases. Pennak said his group is considering court challenges for both the bump stock and protective order bills.